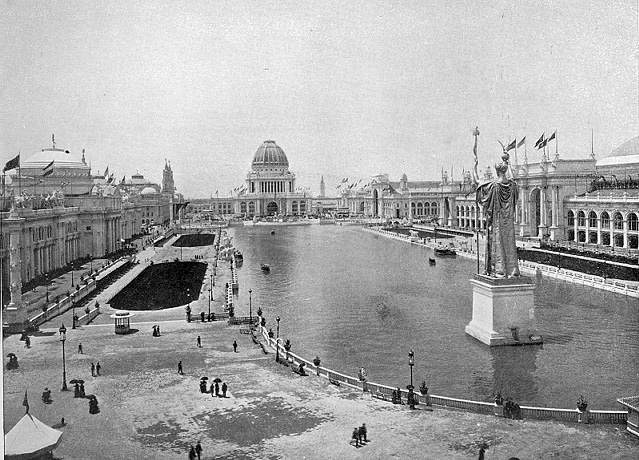 The World's Columbian Exposition, held in Chicago in 1893, was the last and the greatest of the nineteenth century's World's Fairs. Nominally a celebration of Columbus' voyages 400 years prior, the exposition was in actuality a reflection and celebration of American culture and society, and a blueprint for life in modern and postmodern America. The fair had a profound effect on architecture, the arts, Chicago's self-image, and American industrial optimism. 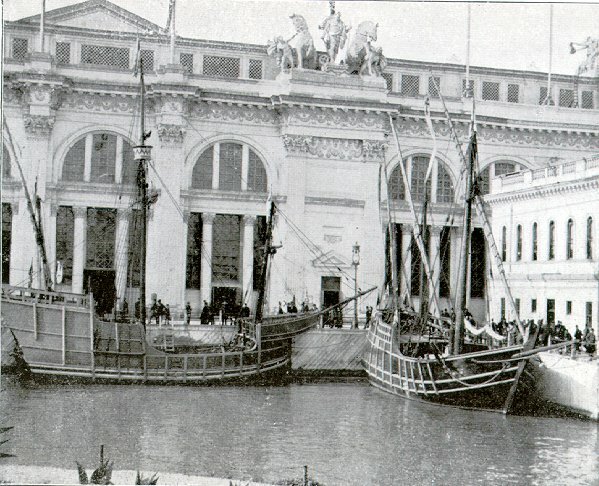 The exposition covered more than 600 acres (2.4 km2), featuring nearly 200 new buildings, canals and lagoons, and people and cultures from around the world. 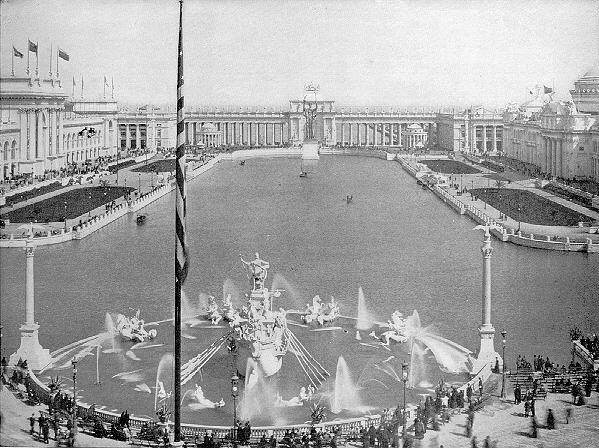 Over 27 million people (equivalent to about half the U.S. population) attended the exposition. 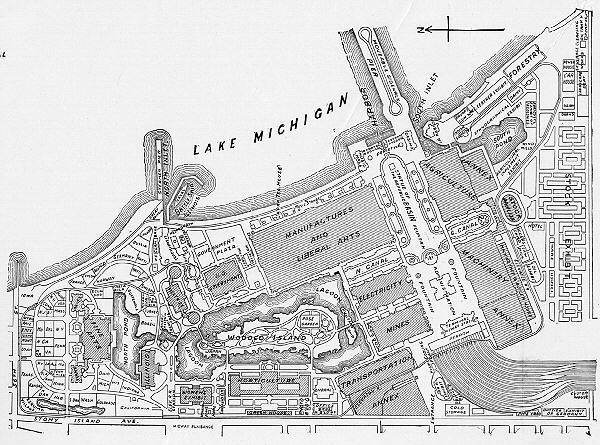 The Exposition was, in large part, designed by Daniel Burnham and Frederick Law Olmsted. It was the prototype of what Burnham and his colleagues thought a city should be. It was designed to follow Beaux Arts principles of design, namely, European Classical Architecture principles based on symmetry and balance. The area at the Court of Honor was known as The White City. The buildings were made of a white stucco, which, in comparison to the tenements of Chicago, seemed illuminated. It was also called the White City because of the extensive use of street lights, which made the boulevards and buildings usable at night. The vision of unity so important to a fractured America found its first and most obvious expression in the pristine whiteness and logical construction of the 14 "great buildings" of the Fair, particularly the Court of Honor. The very rhythm of the grouping and their beauty were somehow soothing to visitors weary from the rigors of early modern America. Robert Herrick observed years later that the "people who could dream this vision and make it real, those people...would press on to greater victories than this triumph of beauty--victories greater than the world had yet witnessed." (Memoirs of an American Citizen, 1905) The visceral response to this visual representation of beauty and unity was widespread; visitors were ready to receive this message. It left a remembered vision that inspired the Emerald City of L. Frank Baum's Land of Oz and Walt Disney's theme parks. Disney's father Elias had been a construction worker on some of the buildings at the fair. 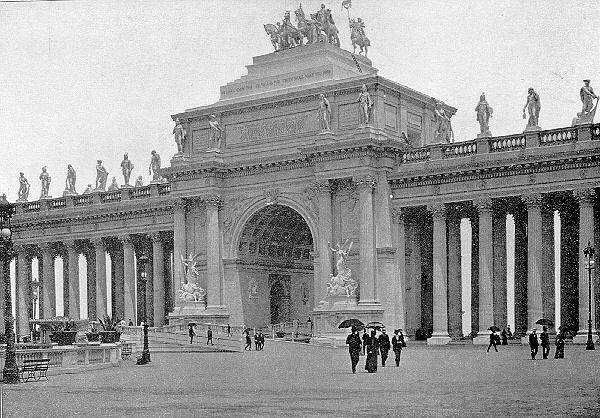 The World's Columbian Exposition was the first world's fair with an area for amusements that was strictly separated from the exhibition halls. 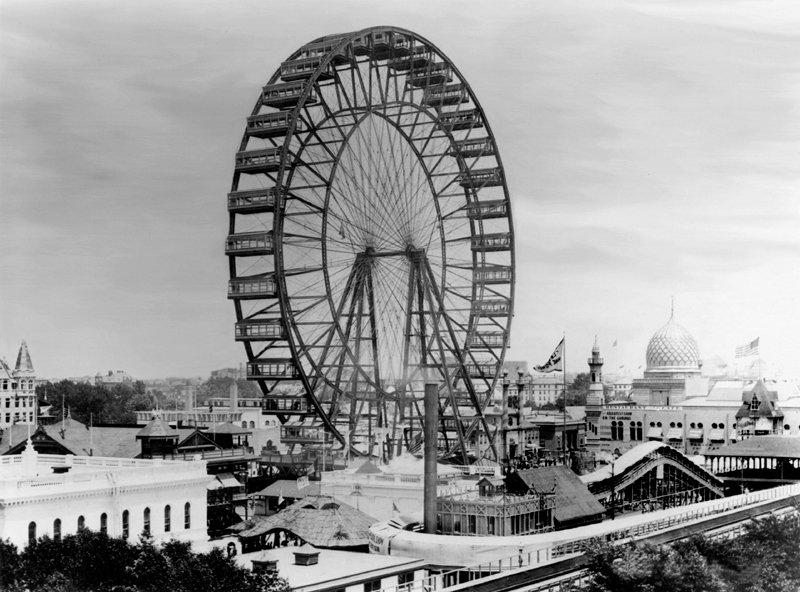 It included carnival rides, among them the first Ferris wheel, built by George Ferris. This wheel was 264 feet (80 m) high and had 36 cars, each of which could accommodate 60 people. One of the cars carried a band that played whenever the wheel was in motion. 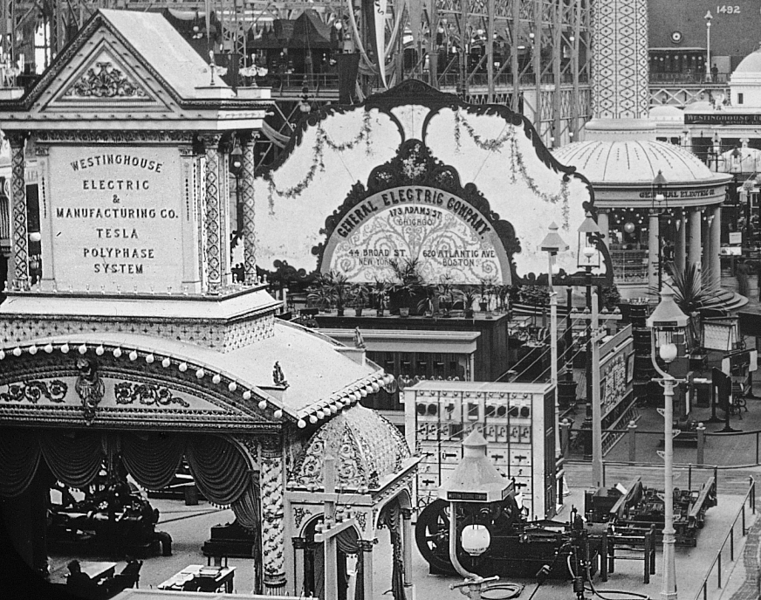 Westinghouse, armed with Nikola Tesla's alternating current system, proposed to illuminate the Columbian Exposition in Chicago for $399,000, and won the bid. It was a historical moment and the beginning of a revolution, as Nikola Tesla and George Westinghouse introduced the public to electrical power by illuminating the exposition. Tesla displayed his phosphorescent lighting, powered without wires by high-frequency fields, and employed a similar process, using high-voltage, high-frequency alternating current to shoot lightning from his fingertips. Tesla displayed the first practical phosphorescent lamps (a precursor to fluorescent lamps). Tesla's lighting inventions exposed to high-frequency currents would bring the gases to incandescence. Tesla also displayed the first neon lights. Eadweard Muybridge gave a series of lectures on the Science of Animal Locomotion in the Zoopraxographical Hall, built specially for that purpose on Midway Plaisance. He used his zoopraxiscope to show his moving pictures to a paying public. The hall was the first commercial movie theatre. The Electrotachyscope of Ottomar Anschütz was demonstrated, which used a Geissler Tube to project the illusion of moving images. Milton Hershey bought a European exhibitor's chocolate manufacturing equipment and added chocolate products to his caramel manufacturing business. The United States Post Office Department produced its first picture postcards and Commemorative stamp set. United States Mint offered its first commemorative coins: a quarter and half dollar. Alan Trachtenberg, The Incorporation of America: Culture and Society in the Gilded Age.